My most successful and versatile piano game, which is loved by all my beginner students and requested in every lesson even beyond grade 1 level, is simply called The Note Name Game. I play variants of it but the two main versions involve either flash cards or dice. Put a token such as an eraser at each end of the keyboard, one for you and one for the student. Make sure the token cannot damage the key surface or slip between the keys. Mark the exact middle of the piano. I use a third eraser just placed on the keys. If necessary or wished, get the student to count keys and verify that the exact middle is (usually) the line between E and F above Middle C, not Middle C itself. This is the "finishing line". One of you takes a card and moves their token to the nearest note of that name going towards the finishing line (you will be going in opposite directions). The other player takes their turn, does the same, and so on until one of you crosses the finishing line. It is possible to win in four moves, or it can take ages while you get only a semitone's move for several goes. If they are really not ready for black key names, take those out of the deck, but actually I find it's a great way to teach them how to find black notes. You can always prompt them and reinforce how to know where a flat or a sharp can be found. Here's a version of the game with a guest appearance of Sandy Holland's piano pupil, Luchia! Now for the dice version. You need the same tokens/erasers but also two dice, ideally in one of those transparent sealed shakers from which they can't escape and roll under the piano! No cards needed for this version. However, the student needs to know about semitones (half steps), and preferably whole tones as well. Counting tones and semitones is a big part of understanding scales and keys, so this game is a great help in making it automatic. First player rolls the dice. Add up the numbers and move that number of semitones towards the finishing line. Important step: they must NAME the note they land on. Depending on their knowledge, they could use one, two or more names (up to all the enharmonic equivalents) or with more advanced students you could require really clever names such as "the mediant of F minor" or "the key with four flats in its key signature" depending on your teaching goals. Other player does the same. Repeat in turn. First to the finishing line wins - but of course that isn't the point. Whole tone variant: if player throws a double (two dice showing the same value) they must count their turn in whole tones instead of semitones. For the beginners this takes a lot of guidance but it adds a nice feeling of advantage (double six gets you a move of two octaves!) and if they play the notes as they go it adds a new sound to their musical memory. I'm sure you can see the enormous teaching potential of these two simple games, well beyond naming notes and counting intervals. 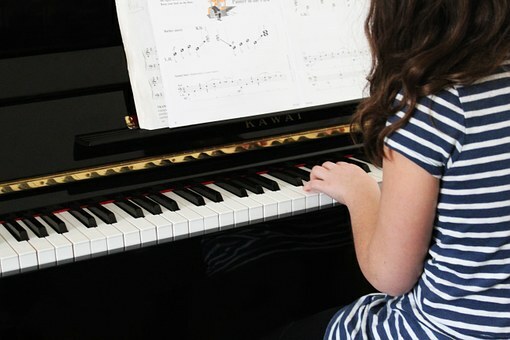 Some other challenges you could include for older students could be "play the major triad (in whatever inversion you choose) on that note", or "first sing the note you're heading for, pitching it from the previous player's one" (within their vocal range, obviously) before playing it to confirm. Have fun!